2: That's saved our bacon. 3: A bit of a boar today. DIY silk purse step 1. Caught up with Boris Johnson at last. Somebody squealed, I tell ya! Sowhat do we 'ave 'ere then? Gilets jaunes protests extend to England ! "Here, I thought I told you to take that pig to the zoo." "We did, and it was just lovely, so now we're on our way to the ball game!" The Empress of Blandings survives her diet and leads authorities to the malefactor. "What's a Yorkie doing way down here in the Thames Valley?" Look how easy it was! Jack scratched the pink swine and I put a rope around it's neck and off we go to the butcher. Now do the same with your orange swine! We're gonna need a bigger poke. 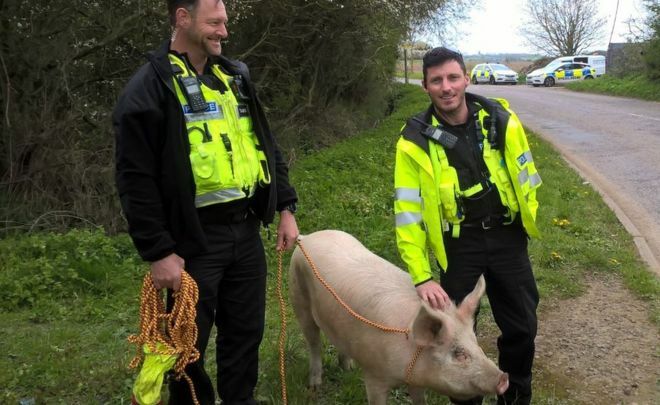 Now when they yell "pig" we wont' have to think they mean us. How do we form a mutiny? Our new captain is navigating poorly.